Dave Blood\'s collection includes sets that go back to 1913, the first year the toys went on the market. At left is part of one room of Blood\'s two-room collection. Part of one room of Dave Blood\'s two-room collection. Locomotives could be built with some Erector Sets. Dave Blood, a retired machinest, had trouble finding wheels for this one, so he made them himself. Some Erector Sets came in large boxes. Dave Blood\'s collection of vintage Erector Sets includes every edition of the toy made in 1913, the first year the toy came out. 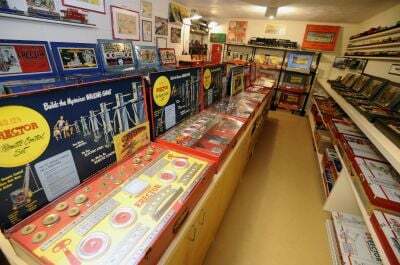 Dave Blood, a retired machinest in Racine, has an impressive collection of vintage Erector Sets. Cabinets are filled with spare parts collected from incomplete sets. Spare parts are kept in cabinets. Most of the items in Dave Blood\'s collection include the instructions and original boxes. Photo shows various wheels and other parts that came in some Erector Sets. Display shows all the pieces in a 1931 Erector Set. Dave Blood has a virtual museum devoted to Erector Sets. His collection fills two rooms. One hundred years ago this year, A.C. Gilbert introduced what would become one of the most iconic toys of an era: the Erector Set. If your childhood fell somewhere between 1913 and 1962, you likely had one, or knew someone who did. Dave Blood of Racine remembers his first set — a 1948 No. 6 1/2 — that he received for Christmas in 1948. Erector Sets weren’t cheap. For many parents, giving their child one as a gift was a sacrifice. However, A.C. Gilbert, the inventor behind the assemblage of metal beams, bolts, screws, pulleys, gears and motors, was also a smart businessman. Blood pointed to a cardboard box, no bigger than the size of board game box. Next to it are nine other boxes, sets 1913 No. 2 through 1913 No. 10. Each subsequent box is a little bigger, contains a few more parts and a slightly higher price tag. Back then, the price would have varied between 25 cents and $25. “A.C. Gilbert was very smart in making sure there was a price-point that appealed to every socioeconomic class,” Blood said. He also came up with three words that would justify any price point: career-building toys. “Which was clever because kids don’t like the idea of educational toys,” Blood said. Framed as “career building,” parents saw the Erector Sets as a worthwhile investment, and kids saw Erector Sets as a fun toy. It worked. Blood not only remembers spending hours building bridges and towers, but using any extra money he earned through his paper route, and later a job setting pins at the local bowling alley, to purchase additional parts. After high school graduation, Blood accepted a machinist apprenticeship with Simmons Co. in Kenosha, then held jobs as a tool designer, a plant manager for a steel fabrication company, and various positions at Gateway Technical College, including tool and die instructor, industrial machine repair instructor and department chairman of trade and industry. Occasionally, Blood, an avid sailer, would put his machinist’s skills to use to repair or make parts for his sailboat or the other boats that belonged to the same yacht and sailing club. “There’s definitely a connection,” Blood said. He isn’t the only one who recognizes the impact of the toy, which ceased production in 1962. Blood belongs to the A.C. Gilbert Heritage Society, a 430-member club dedicated to collecting Erector Sets. He also edits the club’s newsletter. “Most of us had these toys when we were kids, so it’s kind of an aging group,” said Blood, who will turn 76 this spring. Members of the club have different collecting styles, he explained. “The younger guys, those that are in their 40s, seem to be real interested in the early sets from the teenage years and 20s,” he said. “I’m more interested in having the best quality sets over having the most sets,” he said. Still, 175 sets that occupy two rooms, each the size of a two-car garage, is jaw-dropping. Equally surprising, not one set is from Blood’s childhood. “The Erector Set I had when I was a kid, I sold,” Blood said. He said he sold it when he was raising money to buy his first Harley. The memory of the toy, however, never left him. In 1993, when he started collecting Erector Sets, he bought back that first set along with a “few” others. In addition to owning one set from every year A.C. Gilbert was in production (except for years where the sets were too similar), Blood also owns a few rare sets, like the 1931 No. 10 and 12. One of nine in existence, it’s the largest set A.C. Gilbert ever created. Its contents fill an 8-by-3 foot display case and are housed in a large wooden case that stands about 3 feet tall. It originally sold in 1931 for $69.75. “I’m also the only one in the country — maybe even the world — that has all of the 1913 sets,” Blood said. While age and rarity make some sets jewels, others are unique because of their case or contents. Take the 1924 No. 8, for example, housed in a refurbished wooden ammunition box from World War I. Or the skyscraper set that came with cardboard panels. But perhaps Blood’s most interesting set is the 1917 No. 8. Usually, Blood doesn’t know who the previous owners were — except for this one. His name was Harold Heal, and he was from Pittston, Pa.
Aside from the set’s pieces, the box also contained black and white photographs of a boy standing next to the various structures he built using the set. Also inside are Erector Engineer diplomas, given to Heal by the A.C. Gilbert Co. for contests he won. In one photo, Heal stands proudly next to what is likely one of his contest-winning structures. But not all of Heal’s creations were for contests. One photograph shows Heal used his skills to construct a doll bed for his younger sister. But what Blood does know is the toy made an impact on a boy’s life, the same way it did his. 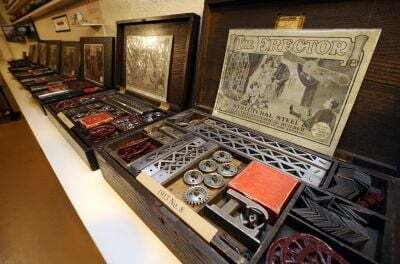 “I have the collection to capture the nostalgia of a bygone era and my childhood, a time when children used their mechanical skills and their creativity to build projects either by themselves or with their dads,” Blood said. Blood hopes collections like his can spark an appreciation for the toys and the skills they produced in a new generation.